It’s time to take your at-home-pizza-eating to a whole new level with new pizzeria! from Digiorno! Disclosure: I received a few coupons in the mail to try them out and will be compensated to let you know what I think, but all opinions are my own! New pizzeria! from Digiorno pizzas begin with a crust that’s golden crispy on the outside, soft and airy on the inside and drizzled with extra virgin olive oil. The sauce is made with vine-ripened tomatoes, garlic and herbs and finished with premium meats, cheeses and veggies. pizzeria! from Digiorno pizzas offer the flavor and texture of true pizzeria-style pizza but you make right at home – in about 20 minutes. You can’t get much more simple than that! The new pizzeria! from Digiorno line of pizzas are pretty awesome if I do say so myself! I like plain old cheese pizzas, or if I’m feeling adventurous, I like pepperoni. Chris and I love pizza, so when Angeline spent the night at her friend’s house last week, we had a little pizza night and rented a movie. It was the perfect at-home date night! pizzeria! from Digiorno Quattro Formaggi/Four Cheese features the perfect bubbling combination of mozzarella, fontina, parmesan and pecorino romano cheeses. pizzeria! 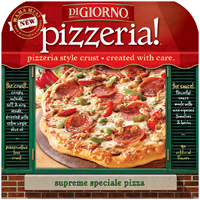 from Digiorno Supreme Speciale offers a delectable blend of premium meats and vegetables including pepperoni, Italian sausage, red and green peppers and caramelized onions. pizzeria! from Digiorno Primo Pepperoni takes a classic to new heights, with the perfect combination of savory pepperoni and premium cheeses. pizzeria! 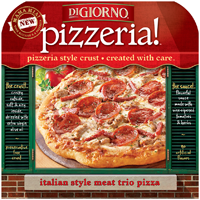 from Digiorno Italian Meat Trio features an antipasto-inspired combination of premium meats including pepperoni, Italian sausage and Genoa salami. Sounds totally delicious, right? They really are! I was a little skeptical about trying frozen pizzas because let’s face it – sometimes they aren’t so great. I usually have to add extra mozzarella cheese to our frozen pizzas, so I don’t buy them very often. I didn’t have that problem with the pizzeria! from Digiorno pizzas. Something that kind of shocked Chris and I was the amount of herbs and spices on the cheese pizza – you can clearly see all the little herbs when you take it out of the box! We don’t have a pizza stone, so I was relieved to see that the instructions called for the pizzas to be placed directly on the oven rack. It was a little tricky getting it out of the oven once it cooked, but we just slid a cookie sheet beneath it and then slid it off onto the counter to cut using our pizza slicer. Looks pretty delicious, right? I would never have expected a frozen pizza to look so tempting! The new pizzeria! 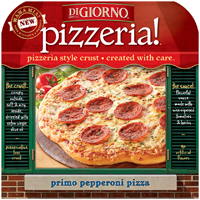 from Digiorno pizzas are available nationwide at your local grocery stores and Walmart in the freezer aisle. 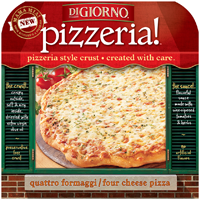 You can find out more about Digiorno products at Digiorno.com! It looks like great pizza! I haven’t tried frozen pizza in a while. I love their pizza, I prefer it to delivery actually. We like their pizza too — always a good idea to have frozen pizza stocked in the freezer for a quick dinner or when guests come over. I like their pizza better than most restaurants and since my date nights are almost always at home, this is the perfect time to try their new pizzas. I like their pizzas; however, my children are not that crazy about them. I wonder if they will like this new variety…. Friday night is pizza night at The Quirky Household, so I will try these next Friday. The kids always enjoy indulging in frozen pizza and these new varieties look absolutely mouth watering! YUM. Pizza is always a favorite at our house. DiGiorno pizza is practically a staple in my house.